In the U.S., this practice became widespread around 1960. 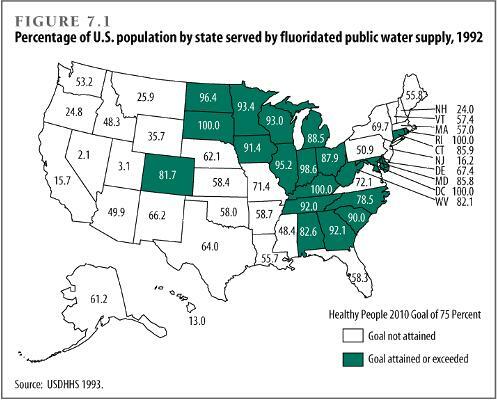 To this day, the state with the most cavities per capita is Utah (I lived there between 2000 and 2010) because the Mormon church will not allow fluoridation of water. Trust me, when it comes to state government what the Church says, goes. Back in the 1940's, children in my home town (Newburgh NY) were pitted against children in Kingston NY (just up the Hudson River) to see comparitively which group developed the most cavities. Newburgh's water had been fluoridated, while Kingston's was not, and acted as a control in the 'experiment.' Results back then showed that far less dental cavities developed among the kids from Newburgh, vs.those in Kingston. The Dentist community in Newburgh was probably not so ecstatic about the result.